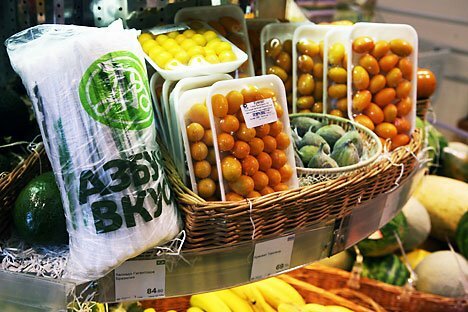 There is a growing interest in organic food in Russia, but many challenges remain before the products enter the mainstream. “Two years ago, nobody knew about organic food here,” said Ivan Yakushkin, Vice President of the World Peace Culture Fund; a group involved in the promotion of organic food and farming affiliated with the International Federation of Organic Agriculture Movements. But now savvy Russian consumers are starting to look out for products and restaurants that bear the label. Isaac Correa, owner of Icon Food, which owns the restaurants Correa’s and Corner Burger and café Upside Down Cake in Moscow, and Ian Zilberkweit, chief executive of Le Pain Quotidien in Russia say that they have seen a greater number of people coming into their establishments who are interested in knowing where their products are from and how they are grown. According to Correa, this increased interest is because people say that they want to eat lighter and fresher, and organic food is perceived to meet this demand. And in a city where higher prices are often believed to indicate higher quality, organic food is noticeably more expensive. In Moscow supermarket Azbuka Vksusa, Yakushkin points out milk from Eto Leto costing 99 rubles ($3.50) for 750mL (1.5 pints); in organic food shop Bio Market, organic juice exclusively from Germany costs 235 rubles ($8) and just 100g (3.5 oz) of Clipper fair trade instant coffee costs an extortionate 1,060 rubles ($36). In a country where the average working person earns about $770 a month, at these prices, buying organic food that is organic is not a primary concern. But it doesn’t have to be that way. In Russia anyone can put “organic” or “natural” on their products as there are no laws limiting the use of the term. “People need to know, not that it’s just organic, but also where it comes from,” said Yakushkin, highlighting another issue. “They need to believe that if one percent of the proceeds go to a farmer then they actually go to them. They may not be able to donate lots of money to a charity or to help out with volunteer work but they can make a simple choice in the supermarket to help out the planet and a farmer and buy organic or fair trade. At the moment Russians don’t have that option so they can’t make that choice. Some people are ready to buy – they just need the possibility. “Organic food is not supposed to be more expensive, it’s meant to be simpler,” he added. Developing an authentic certification standard for organic and fair trade products in Russia could prove to be a boon for Russian farmers and producers as well as consumers. According to Correa, although they do not guarantee the steady stream of supplies often required, markets could become a good source of organic food for restaurants: “I might be able to go to the market and find some stuff that would be great to use, but the thing is that, for restaurants, you need to get it certified; you need to get the product registered,” he said. In fact, Russian producers could have more success selling abroad than at home. Part of the reason that people choose to buy organic is that they want to make the right food choices for themselves and for the planet. But according to Yakushkin, Russians have a fatalistic attitude to life, which can affect their product choices. “They are stressed and depressed by the whole system – if you want to do something good the system will crush you. This means people do not care about themselves – they feel that they do not have the power to change things,” he said.